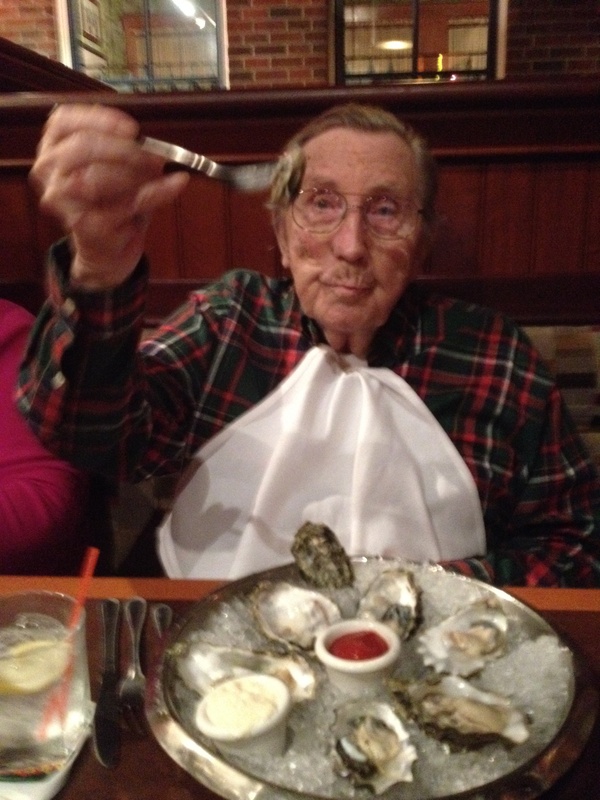 Dad’s 95th birthday dinner. He LOVES oysters. This morning I had a conversation with my 96 year-old father about Memorial Day and his recollections of World War II’s impact on his life. When thinking about my dad’s personality and what his life was like during the World War II era, “brave” would not be a word that would immediately come to mind in describing my father. I certainly don’t mean to take anything away from him, but Dad never served in uniform, never saw combat and never really experienced any frightening or dangerous ramifications of the world war he lived through. He is a wonderful and dedicated father, a loving and faithful husband, a wise and generous provider and a very accomplished chemical engineer who designed polyethylene (plastic) plants all over the world. But the concept of “brave” doesn’t enter the picture when I think of my Dad. After our discussion this morning, I learned something about Dad’s experiences during World War II that came as a big surprise to me. In our family, conversations about my father’s life in the 1940s during what his generation called “The Great War,” were centered on Dad’s work for an ammunition factory. He was a Canadian citizen, newly graduated from University of Toronto with a chemical engineering degree and was seconded by the US government to work in a US ordinance factory in Texas. My dad is a very quiet, understated and introverted man and I always assumed he got through those war years without any real concerns or personal stress related to the war effort. During his service at Cactus Ordinance Works near Amarillo, Dad met and married my mother, so I’m guessing they had many happy memories from those days and not very many experiences related to the horrors happening overseas. My mother’s brother, Randall, served in the Navy, and thankfully survived the war without harm. I always assumed my father felt relatively little stress during those war years. I was wrong. What I didn’t learn until this morning was that because Dad was a Canadian citizen and worked in the United States, he could have been drafted at any point during the war by either country – essentially doubling his chances of being drafted into military service. Every few months when he was required to report and be tested for conscription consideration by both the USA and Canada, Dad never knew if he’d be going back to the ordinance factory or sent on to basic training. Luckily, both countries determined that his skills were better served by staying at Cactus Ordinance Works near Amarillo rather than putting on a uniform and being sent overseas. My father could have returned to Canada and cut his chances of being drafted into military service in half, but felt his work in the United States munitions factory was so important, that he took the risk. Dad’s bravery was a different kind of bravery shown by those who volunteered for military service and a different kind of bravery from those who served in the nearly literal hell of combat. A different kind of bravery from those who died as prisoners of war and a different kind of bravery shown by family members of soldiers stationed overseas. A different kind of bravery shown by the loved ones of fallen or missing soldiers. A different kind of bravery than those whose war wounds have impacted their lives on a permanent basis. On this Memorial Day, I honor all those who served our country in so many brave and selfless ways. My father’s bravery was very much like his own personality – very understated. And on this Memorial Day, I also honor my father whose personal and quiet bravery was understated, undocumented and undecorated, but bravery nonetheless. Thank you, Dad, for your service during World War II in that sweltering hot munitions factory out in the Texas desert. Your contribution to freedom will not be forgotten.